Lately, SUV’s have been crossing over that fine line of utility to versatility. As Car and Driver said “everything has been explored,… no more trails to blaze,… and the paths have been found.” But what if there are still those treacherous mountain paths that demand a proper chassis and 4-wheel drive system that can survive more than just a picnic lunch on a sunny day? Well, the 4Runner is the one to have. It’s a dinosaur underneath working on a body-on-frame designed to take as much of a beating as you can give it. Updated for 2014 the new 4Runner has been modernized with an even more masculine chiseled body. The front fascia is more aggressive and stern with bolder lines a wider stance and a large grille that eats up as much air as the fuel that fuels it. Hard lines continues down the sides flaring out the wheel arches filled with 20″ alloy wheels and chunky tires. The chiseled look continues over the muscular rear clear LED taillights and large chromed 4Runner emblem. If you spring for the whole package like I have on this Limited 4Runner coated in a specialty $395 Blizzard Pearl, you’ll get largely bold chromed accent trim across the front grille, silver roof rails, and rear spoiler with integrated wiper. Although pricey our 4Runner also came with the $1,500 automatic running boards that fold out when you open the door and roll back up after the door is shut. This option is a feature worth purchasing since it is properly high off the ground. Across all trim levels a 4.0L 24-valve V6 with Dual Independent VVT-I engine puts out 270 horsepower and 278lb-ft of torque to the all-time 4WD system. Weighing just 6,300lbs, this tank takes an impressive 8 seconds to 60mph through an old school 5-speed automatic. But the 4Runner isn’t about performance… it’s a proper SUV. The 4Runner feels heavy in every way possible. Steering is stiff and takes a lot of effort from the drivers end; and if you need to make a U-turn, be prepared to make it a 3-point turn. When it comes to stopping, its just best to keep your distance from the vehicle in front of you. And if you’re looking for great gas mileage; 15mpg city and 17mpg highway with a combined 16.5mpg is about what you can expect. It will even take a chunk of cash out of your bank account to fuel up at $55 on Unleaded Plus fuel. But at least a lot of territory can be covered with 340 miles on tap. This is what I love about the 4Runner, staying true to its roots. 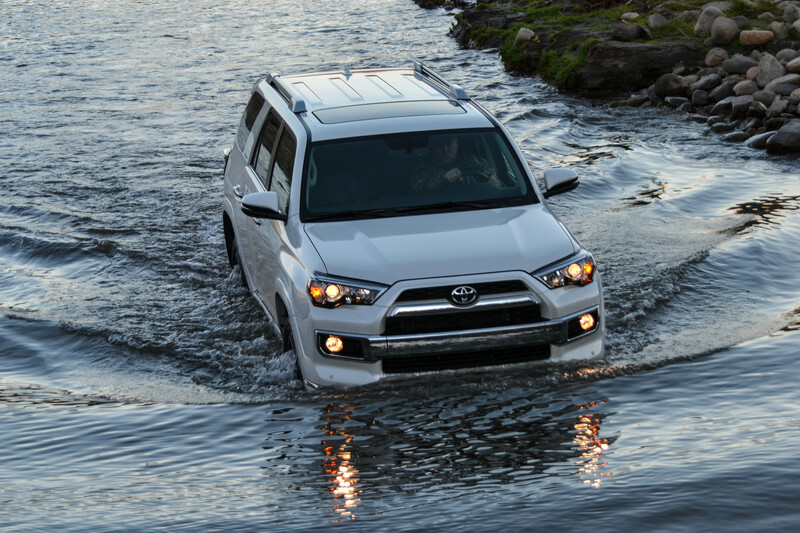 The 4Runner is designed to eat up unpaved roads and go where no Crossover vehicle belongs. To test out its true capabilities, I didn’t have to go far from Phoenix to find an off beaten path and kick the 4-wheel drive into high gear. In Arizona, as hard to believe, it is difficult to find sand, snow, or even mud without traveling more than a few hundred miles and that’s if we’ve had rain or snow… however, I was able to put the 4Runner to the test at rock and cliff climbing. Doing this opened up the opportunity to work with 4WD-Low, A-TRAC system, and the DAC (Downhill Assist Control). Driving on the trail, the standard 4WD system did its job tackling the terrain without losing any traction while also providing a smooth and comfortable ride. As I approached steeper hills I popped it into 4WD-Low, locking the center differential providing equal power distribution to all 4 wheels. Climbing up these hills, the 4Runner proved itself quite worthy of a proper off-roader, while the high ground clearance allowed it to trump large objects. When one front wheel and one rear wheel manage to get off the ground, I activated the A-TRAC system providing proper traction and torque distribution making the 4Runner power through without breaking a sweat. The hills were fairly steep and when going down the intense slopes I activated the A-TRAC system again as well as the DAC. The DAC system was really loud and vibrated quite a lot; I found that managing the braking myself was more efficient and giving me better control. During this small course I encountered more of your basic off-road trail blazing; but when moments did get rough and the standard 4WD system just didn’t cut it, all the technology built in showed great promise in the 4Runner. One might expect the interior to be full of cheapness in an off-road vehicle. However, with the 4Runner, the interior is full of quality materials. Sure, they’re still plastic but it is all well hidden behind the muscular dash and large silver center console. Everything in the 4Runner is designed for abuse; all the knobs are bulky and wrapped in rubber for better wear and great if you’re wearing gloves. Fantastic looking dark wood is carried over the passenger side of the dashboard and onto the gear lever for that touch of luxury. Black perforated leather is carried through the cabin; sitting in the 4Runner is superbly comfortable, which is great for long journeys or awful traffic. Both driver and front passengers can find ease in comfort through power adjustable seats, dual zone climate control and heated & ventilated seats. Back seat passengers can enjoy loads amount of legroom, headroom and 3-way recline. This 4Runner came with the optional 3rd row seat – to put it nicely, I would not want to be the one that draws the short stick. It is difficult to fold out, impossible to access, and uncomfortable to be in with no headroom or legroom. That’s $1,365 you should keep in your pocket. Like most Toyota products this 4Runner came with the 6.1” touch screen display. Opting for the Limited gets you standard Navigation with Entune and JBL Audio. Like the Corolla and RAV4 the entire Entune system and App Suite is a fantastic system; it’s easy to use and navigate as well as use the voice command system. With the App Suite you can get Weather updates & Live Traffic Alerts, Pandora radio, Sports, Fuel, plus many other fantastic features. My only issue with it being in the 4Runner is that it is quite small against the large dash. I do enjoy what Toyota have done to the command system; greeting you with “How may I help you?” Its nice not being yelled at to speak a command. If you opt out of the 3rd row option, you can expect proper SUV cargo capacity that can fit just about anything. Fold the 2nd row seats and a mountain bike will fit perfectly. If you do however opt for the 3rd row, my suggestion is to leave it down most of the time; you’ll lose 95% of your trunk and you won’t see out the rear window. The 4Runner is an amazing SUV; there is so much to love about it, even its imperfections. It will quite literally trump any terrain you throw at it. For when you’re not off in the wilderness the 4Runner is also a great city vehicle. It’s very comfortable, quiet at high speeds and room for every.